Boss realized that many bass players love their amps and may not need the GT-6B amp/speaker modeling. Also, a lot of bass players love easy-to-access, manual mode effects. So here comes the Boss ME-50B with world-class bass effects in a rugged floor unit with easy pedal-style control. Effects are divided into six sections (Compressor/Limiter, Master EQ, Filter/Tone, Drive/Synth, Delay/Modulation and Expression Pedal), giving bassists a range of unique and powerful tones including effects like Sound Hold, Octave Up and Kick Drum -- all with easy knob-based control. The modeled compressors are PERFECT for bass; the defretter really sounds like a fretless. The innovative Sound Hold function sustains a low note while playing over it (cool) and you also have Sound On Sound recording, this time with a Kick Drum effect for keeping time. A handy "Octave Up" effect adds a note one octave above the original while retaining your natural bass sound -- complete with adjustable drive on the octave-shifted note. There are tons of synth-like filtered sounds. This is the piece no bass player should be without. - Dedicated knobs for each effect section - no menu-surfing! - 3 footswitches and onboard expression pedal routed to 6 options like Octave, Wah, etc. BOSS understands that bass players want access to powerful effects, but they don't want to get caught up in the menus and programming hassles of a multi-effects processor. Enter the ME-50B. 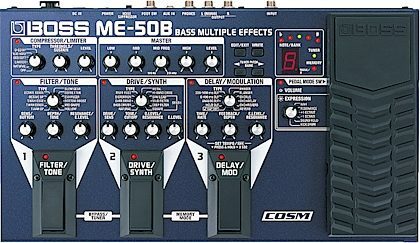 Just like its guitar-oriented sibling, the ME-50B puts BOSS finest multi-effects for bass into a convenient floor processor with the feel of a compact pedal. Forget about menus and cursor buttons. Just reach down and twist a knob! Everyone knows that the fundamentals of good bass tone are compression and EQ. That's why the ME-50B features two dedicated sections for these essential effects. The ompressor/Limiter uses advanced COSM modeling including a 'Natural' compression setting that retains the nuances of your playing'to give you tight, punchy tone. Simply select the compressor 'Type' and adjust the Sustain/Threshold knob to get the tone you want. The Master section includes a 3-band EQ with a sweepable mid for precise tonal shaping. 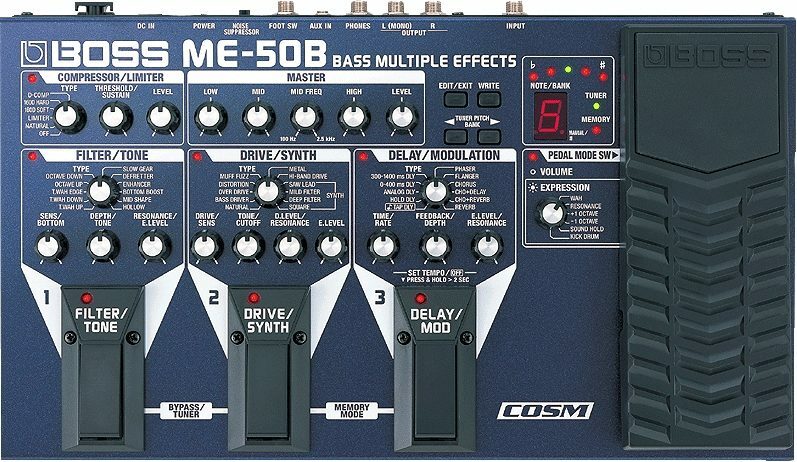 The ME-50B includes a variety of unique tone-shaping effects just for bass. These include a handy "Octave Up" effect, which adds a note one octave above the original while retaining your natural bass sound, complete with adjustable drive on the octave-shifted note plus favorites like Slow Gear, T-Wah and a Defretter effect for instant fretless sounds. Using the Tone effect preset, you can get quick tonal variations with preset EQs like "Bottom Boost" and "Mid Shape." Want some extra bite? Switch on the ME-50B's Drive effects, which include settings like "Muff Fuzz," "Bass Driver," 'Natural' and 'Metal' to give you a range of overdriven/distorted sounds. A Hi Band effect creates a distorted sound on the high frequencies while keeping the lower frequencies intact, perfect for creating complex tones while keeping your original playing dynamics. There are also four synth bass sounds with superb tracking and natural feel. Sound On Sound recording is very popular with guitarists, and now bass players can build their own loops, too. But the ME-50B can do even more. Using the Kick Drum function, players can tap in their own kick drum and create loops over the beat. If that's not enough, check out the Sound Hold function, which lets you endlessly sustain a low note while playing over it. With the ME-50B, bassists can take their playing to a different level. zZounds is an authorized dealer of Boss products. This review has been selected by our experts as particularly helpful. "The Boss ME-50B"
33 of 34 people (97.06%) found this review helpful. Did you? Overall: It's a great gizmo for bass players of all abilities. easy to use and very versatile. I have been gigging with it for about a year now and I think it's worth every penny!